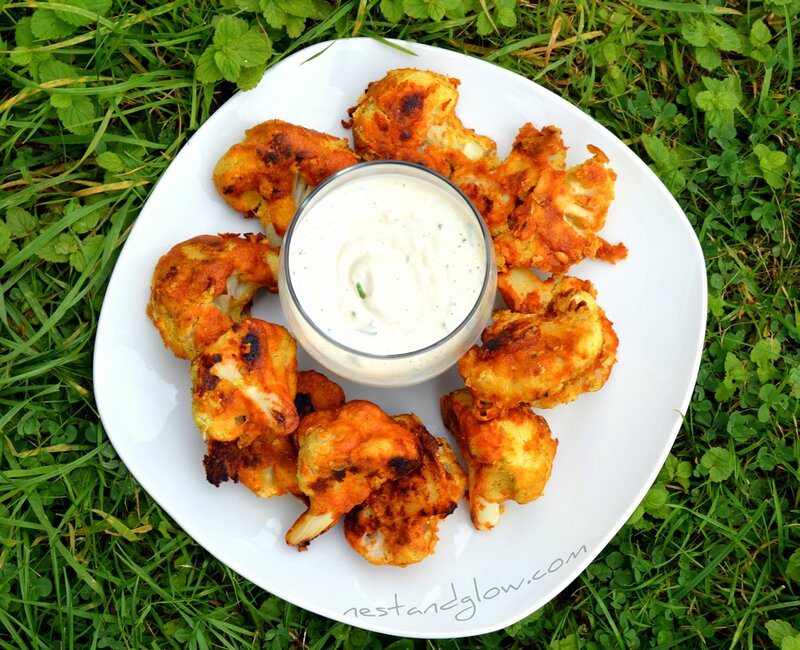 Vegan cauliflower wings that are gluten free unlike most other recipes and high in protein. With a ranch dressing that is dairy free and raw made from cashew nuts. This may take over an hour to do, but most of this time is the oven doing all the work. A perfect starter for 4 people, or 2 very hungry people. In the cauliflower wings recipe the oil is optional as I tend to try to limit cooked oil but once in a while is fine. They are a bit dry without the oil but the raw ranch dressing more than makes up for this. The cashew ranch dressing is great for any salads and is perfect to cool these spicy wings. I first started to use chick pea flour to make vegan wings, but then after the low popularity of my mung bean brownies (who would have thought mung beans aren’t that well known across the globe!) I perfected this recipe using cooked chickpeas. I try to make all of my healthy plant-based recipes with ingredients that people know. Everything in this gluten free vegan wings recipe is from unprocessed ingredients with no packets or jars in sight. The ingredients list may look quite daunting, in comparison to most of my recipes, but many ingredients are repeated and this recipe is still simple but takes a bit longer than the usual 20 mins. The raw ranch dressing can be made with sunflower seeds if you prefer. It won’t be quite as smooth and white but still tastes great! If you’re making a sunflower ranch dressing it’s best to soak the sunflower seeds overnight to aid absorption. Soaking cashew nuts is not required. One of the most common complaints I get about my vegan wings recipe is the name. I know many don’t like the idea of vegan and wings together. However this type of recipe is known and needs to be called something that people know and can find. There’s lots of vegan wings recipes but I created this one to be different as its gluten free and made from high protein chickpeas in place of flour or breadcrumbs. Pre heat the oven to 450 F / 230 C.
Put all of the chickpea batter ingredients into a blender and whizz until smooth. You may need to add more water. Chop one medium cauliflower into bite size florets. Dip all of the cauliflower florets into the chickpea batter and coat. Shake off the excess and place on a non stick sheet and bake for 30 mins until golden. Toss halfway through. Repeat steps 3 and 4 for the chill batter to coat the once baked florets again and bake. Again take out of the oven after about 30 mins once the chickpea wings are golden. To make the ranch dressing blend everything apart from the basil and chives until smooth. Then stir in the chopped herbs and pour into a dipping bowl. Enjoy gluten-free chickpea wings immediately or store in the fridge where they will last a few days. The cauliflower wings are best eaten warm. If you like this recipe check out my Cauliflower burger. It’s basically the same recipe but made into a loaded burger patty with avocado and veggies! can we sub the dates with anything? Yep, I just used maple syrup, worked a treat. This looks delicious! I’m going to try it tomorrow. Just made these, they were so delicious, thanks for the recipe. I put hemp hearts into the ranch dressing too, super yummy! Not sure, do you bake with the chick pea, then recoat and bake again with date batter? Yes exactly that, done in two stages. I know it sounds like a bit of a faff but it does work well.